Eating Disorder Toolkit is a new 1-hour online continuing education (CE/CEU) course that provides an overview of the current research on the prevalence, treatment, and role of the RDN in the care of eating disorders. Professional Development Resources is a CPE Accredited Provider with the Commission on Dietetic Registration (CDR #PR001). CPE accreditation does not constitute endorsement by CDR of provider programs or materials. Feedback for this activity can be sent directly to CDR. Professional Development Resources is also a provider with the Florida Council of Dietetics and Nutrition (#50-1635) and is CE Broker compliant (all courses are reported within a few days of completion). 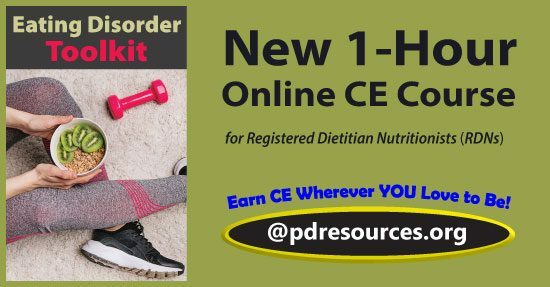 PDR offers over 75 CDR-approved online CE courses for dietitians. Click here to view all.